Nayalap is a glamping (luxury camps) located in a village called Salla Rautela in Shitlakhet. This property is nestled in the rural and nature atmosphere, making it an ideal place for rural holiday experience in Kumaon hills. Guests will be staying in the spacious and decorated luxury tents having all basic amenities. The property offers a rural living experience as guests often meet locals who will invite them to home for tea. This makes one to know the Kumaon villages and its people, culture, tradition from very near. 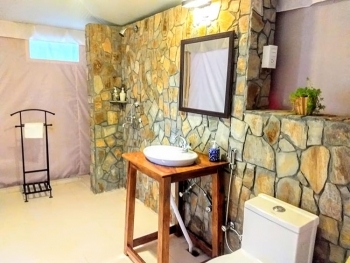 The property is located near Shitlakhet at village Salla Rautela, situated between Ranikhet (28 kms) and Almora (38 kms). Apart from natural sightseeing of villages and forests, one could easily makes day visit to many famous tourist places in Almora & Ranikhet such as Neem Karoli Baba Temple, Syahi Devi Temple, Binsar Sanctuary, Katarmal Sun Temple, Nanda Devi Temple, Chitai Golu Devta Temple, Chaubatia Gardens, Haidakhan Temple, Upat Golf Course, Jhula Devi Temple, Kasar Devi Temple etc. 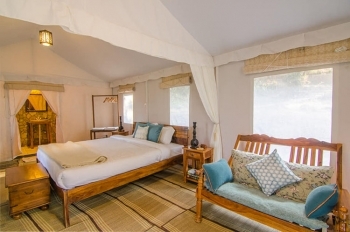 The property offers 4 luxury filled tents with all basic facilities. Each tent has clean wooden beds, attach modern bath and wooden sofa/ chairs/ tables, carpet flooring etc. The property has a dining place where it serves delicious, fresh and hot food with a blend of North Indian and Kumaoni cuisines. Cooked by village grandmother using local ingredients adds tastes in your plate. The property is well connected by road and Shitlakhet. The best way to reach is by road via Haldwani (85 kms). One have to hire taxi from Haldwani to reach Shitlakhet or take local buses. Regular buses are available from Delhi to Haldwani. Nearest rail head is Kathgodam Railway Station (78 kms) and nearest airport is Pantnagar Airport (114 kms) or Delhi airport.